We believe that healthy nutrition is an essential step to build a more sustainable planet. We are a team of young entrepreneurs committed to the idea of making a better world. We know that, from our project, we can help this dream come true. Together with our team members we work, day after day, in order to create long-term strong relations with our suppliers, clients, and the environment around us. Our people are the most important capital for us. Every member of our staff is entirely committed to this project and work following the guidelines for its correct development. -	We speak the truth, always. We do what we say. -	We work professionally, in long term thinking. -	We give our best in every task we undertake. -	In any case of doubt, we seek for advice. From investigation and development (I + D) until delivering our products we focus on the excellence of each process. Argentina, with its productive environment multiplicity, leading technology and human capital, gives us the opportunity to develop our project successfully. - The quality and innocuousness of our products are a priority for us. - We produce and commercialize Non GMO and gluten free food; both conventional and organic. - Our quality team supervises, through internal and external controls, every production stage assuring the quality and traceability of our products from the fields to our clients. 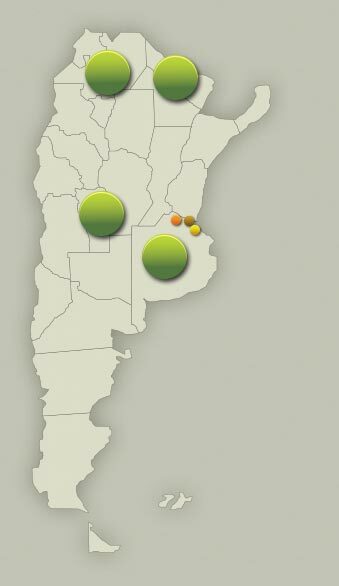 -	In our facility located in Acevedo, Buenos Aires Province, we process our seeds according to each client’s requirements. In order to accomplish with the highest quality standard we have initiated the process to certify for FSSC 22000 (FOOD SAFETY SYSTEM CERTIFICATION). All our products can be found both in their conventional and organic version. 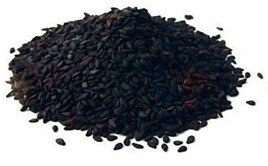 Chía seeds represent the vegetable source which contains the highest omega-3 concentration. It yields 33% of oil, from which 62% stands for alpha linoleic acid (omega-3) and 20% for linoleic (omega-6). 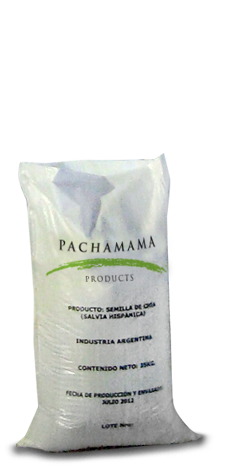 Chía is the crop with the highest content of essential fatty acids (EFAs) since it contains 82% of lipids with this characteristic. Essential fatty acids are fatty acids that people must ingest through food or supplements because the body requires them for good health but cannot synthesize them. They differ from non-essential acids (saturated and monounsaturated fatty acids) since these last ones may be obtained from other nutrients. Essential fatty acids (EFAs) serve multiple important functions in our body: they help to prevent from cardiovascular diseases, to normalize blood pressure, to keep cell membrane flexibility, to reduce cholesterol and they also protect the heart and improve immune and nervous system health. 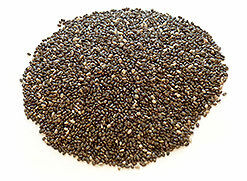 Apart from essential fatty acids, Chia seeds contain a great quantity of antioxidants, especially flavonoids. DESCRIPTION 100% vegetable seed, gluten free. Color: grey, white and black. Appearance: small and oval seed. Smell and Taste: traditional chia, fresh. STORAGE CONDITIONS Dry at room temperature. 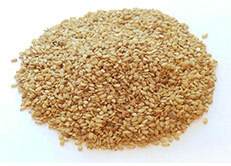 Sesame seed provides a wide variety of nutrition principles of high biological value. Most of its lipids or fat (52%) are constituted by unsaturated fatty acid, and this contributes to a high efficiency in the reduction of the level of blood cholesterol. 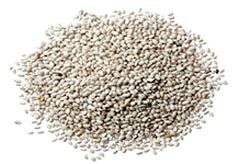 Among Sesame fats, you can find the lecithin, a phospholipid (phosphorated fat), and it is a strong emulsifier. One of its functions in blood consists of keeping lipids dissolved, especially cholesterol, and therefore avoiding cholesterol settles in the arteries (atherosclerosis). The proteins (20%) of high biological value are made up from 15 different amino acids with a high proportion of methionine (essential amino acid). The seed also provides vitamins, especially E (tocopherol), B1 or thiamin (0,1 mg every 100 g), and B2 or riboflavin (0,24 mg every 100g); minerals and different trace elements, especially calcium, phosphorus, iron, magnesium, copper and chromium and mucilage, which acts as a soft laxative. In view of the composition of this small seed, it is not strange the fact that eastern countries consider it as a revitalizing and a sexual stimulating product. DESCRIPTION Seed 100 % vegetal, gluten free. 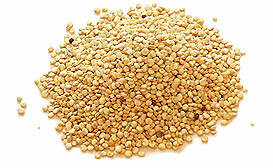 Quinoa has an extraordinary balance of proteins, fats, lipids and starch. The content of protein is high as its embryo constitutes a great part of the seed. The average of proteins in the grain is 16%; however it can reach up to 23%, twice the amount of any other cereal. 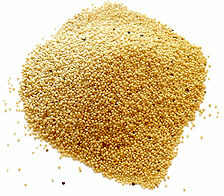 In addition, the amount of proteins that quinoa contains is close to the average that FAO states for human nutrition. Quinoa’s proteins have a high level of amino acids, lysine, methionine and cystine. The seeds contain between 58 % and 68% of starch and 5% of sugar, and even though the grains of starch are small, they contain 20% of amylase. Its fat content varies from 4% to 9%, and half of that fat contains linoleic acid, which is essential for the human diet. Amaranth has many nutritional and healing properties. For instance, it prevents cancer and it stabilizes the levels of glucose and fat in blood (cholesterol). Amaranth is a perfect product for people who suffer from diabetes, liver problems, cholesterol, obesity, arterial hypertension and constipation. It provides more proteins than any other cereal (including oat), and the quality of its vegetal protein is supreme. Recent studies have shown the great importance that the benefits of the seeds and the oil provide to our physical health. 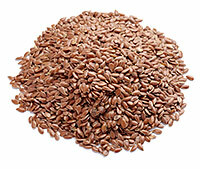 For instance, it helps people who suffer from IBS (Irritable Bowel Syndrome), it has anti-inflammatory and invigorating effects, and also it stimulates and improves kidneys function as linseed contains phytoestrogens called lignans and omega 3 fatty acids, the most important of which is called alpha-linoleic acid.